Just as on Stockholm’s coastline shown in the photo, cities are seeing new neighbourhoods develop or old ones restored and expanded at a rapid pace. Urban planning is a highly complex issue, especially if it involves low-carbon living solutions and environmental regulations. The main objective of the international group of researchers working in Task 51, Solar Energy in Urban Planning, has been to “support planners, architects, and local and national authorities in creating urban areas with architecturally integrated solar solutions in mind.” In mid-September, task coordinator Maria Wall, Professor at the Energy and Building Design department of Sweden’s Lund University, and other researchers presented successful case studies and suitable planning and design tools during a webinar. A recording and the presentations from it are available at the IEA SHC Solar Academy page (link to http://iea-shc.org/solar-academy/webinar/Solar-Energy-in-Urban-Planning). “Distributed energy is challenging central supply, and we see that cities have a very leading role in this,” said Dr Mark Snow from the University of New South Wales, Australia. A growing number of municipalities have set voluntary standards to meet climate targets and fulfil the Paris Agreement. Johan Dahlberg, Sustainability Advisor and Research Coordinator at White, a Swedish-based architectural firm, mentioned Stockholm’s Royal Seaport as an example (see the photo above). His company, which is headquartered in Sweden’s capital, has been part of a capacity-building programme for this big development project of 12,000 houses and 35,000 offices on 263 hectares. Construction is planned to end in 2030. “The city, which owned the land, had specific requirements for selling it,” Dahlberg said about one of the major factors behind the successful project. One prerequisite was the installation of active solar technologies to produce 2 kWh of PV output per year and square metre of floor space or 6 kWh/m2 in the case of solar thermal. Despite solar thermal’s greater efficiency per square metre, only two housing developers opted for a combination of solar heat and electricity to meet the requirements. The other six have so far planned only PV installations. Wall believes that Stockholm’s extensive use of district heating is what makes solar thermal less attractive across the city. Another principal question which the Task 51 researchers set out to answer was: What type of tools and knowledge do urban planners need to make informed decisions? Marja Lundgren from White Arkitekter listed a wide variety of utilities to support urban planners and authorities. A rule of thumb could be as valuable in early-stage planning as a 3D software model for solar mapping or calculating solar potential later on. Often, the average minimum factor is 2 %. Analysing obstruction angles can help planners early on to determine whether or not an urban design concept will fulfil indicator requirements. At the latitude of Stockholm, standard window sizes may be sufficient if the angle is smaller than 30 degrees, but a wider one means that larger windows, perhaps even in combination with higher ceilings, will be needed to reach 2 % (see the following diagram). Of course, designers of active building-integrated solar elements must consider the preservation of cultural heritage, a task for which Lundgren recommended the use of the LESO-QSV method (link to http://www.solarthermalworld.org/content/iea-shc-task-51-integrate-energy-perspectives-spatial-planning-urban-areas). 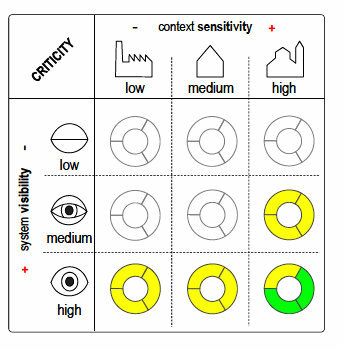 This method developed by the Swiss-based Solar Energy and Building Physics Laboratory of the Federal Institute of Technology Lausanne, LESO/EPFL, makes it possible to specify solar integration quality based on the sensitivity of the associated urban context. The idea is to have municipal authorities adjust minimum local quality requirements and include factors which are necessary for creating smart solar energy policies. An online world map showing 34 illustrative cases of solar-integrated urban developments from 10 countries (link to http://www.solarthermalworld.org/content/iea-shc-attractive-solar-solutions-urban-and-landscape-planning). A PDF for each reference case will contain a project overview, key figures and pictures of the solar installation, plus the key lessons learned during the planning process. A report on tools in education, their test results and new developments in the field. These and other publications will be available at Task 51’s website http://task51.iea-shc.org/publications. Some have already been put online, for example, the case study report titled Illustrative Prospective of Solar Energy in Urban Planning. Over the course of its more than 400 pages, it describes the 34 references pointed to above.